Hyper-local, food with integrity, outdoor dining under the prairie skies. 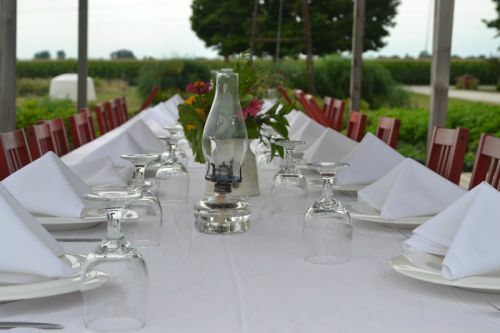 Are you ready for the 2018 "Dinners on the Farm" Season? Our dinner season runs from late May into early December this year. We're posting the spring and summer dates and themes now so you can start planning and purchasing tickets. We'll add more dates and themes as they become available. For general information about our farm to table meals (the basic information, how it works, etc.) visit our Farm Dinners: The Basics. For ticket purchasing, visit our SHOWCLIX Page. Ticket prices listed below do NOT include sales tax (9%), a small service fee (ShowClix) or gratuity. October 6th "Triptych Brewery Beer Dinner" Early October is the perfect time to enjoy a meal designed around beer. Chef Mark Hartstein (currently cooking at bacaro, champaign, IL and was one of the co-founders of Watson's Shack & Rail) and his partner, Leslie Bettridge (GM at Farrens) will be crafting a very special menu that features Bane Family Meats pastured pork and a different beer pairing with each course. $100/person includes beer pairings with each course.